Amazon.com description: Product Description: Why do Republican politicians promise to rein in government, only to face repeated rebellions from Republican voters and media critics for betraying their principles? Why do Democratic politicians propose an array of different policies to match the diversity of their supporters, only to become mired in stark demographic divisions over issue priorities? In short, why do the two parties act so differently-whether in the electorate, on the campaign trail, or in public office? Asymmetric Politics offers a comprehensive explanation: The Republican Party is the vehicle of an ideological movement while the Democratic Party is a coalition of social groups. Republican leaders prize conservatism and attract support by pledging loyalty to broad values. Democratic leaders instead seek concrete government action, appealing to voters' group identities and interests by endorsing specific policies. 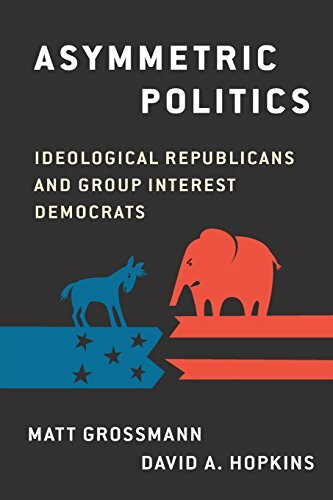 This fresh and comprehensive investigation reveals how Democrats and Republicans think differently about politics, rely on distinct sources of information, argue past one another, and pursue divergent goals in government. It provides a rigorous new understanding of contemporary polarization and governing dysfunction while demonstrating how longstanding features of American politics and public policy reflect our asymmetric party system. About: Why do Republican politicians promise to rein in government, only to face repeated rebellions from Republican voters and media critics for betraying their principles?